The Day of the Dead is a huge, important celebration that happens annually in Mexico, where the streets come alive as the living honour their friends and loved ones who have passed away. The day is a feast to the senses, full of candles, rosaries, skulls, altars, skeletons, food and music, and Play’n Go has captured the essence of the festivities in a vibrant, action-packed pokies game, Grim Muerto. We cover how and where to play this fabulous, lively Mexican themed game for real money online. Day of the Dead celebrations stem from ancient Mexican beliefs that the dead come back once a year to visit their loved ones, not to frighten, but to party together just like they did when they were alive. It’s all about, food, drinks and letting the good times roll, which is exactly what Play’n Go’s Grim Muerto slot game embodies. Grim Muerto is available for instant-play, which means you can play it directly over your Web browser (Safari, Chrome, Edge, Firefox, etc) without having to make any downloads. It’s a five reel, 20 payline video pokies game which features standard lower paying symbols plus high paying symbols like wilds and scatters, plus multiple bonus features. All you need to play for real money is sign up and make a deposit at a reputable casino like the ones recommended on our site, then use the buttons at the bottom of the reels to select your bet. Paylines are fixed, so you just need to place the value of your wager, with coins sizes ranging from $0.01 to $1.00. The minimum bet in Grim Muerto is $0.20 per spin, while the maximum bet is $100, making it suitable for recreational players and high rollers. 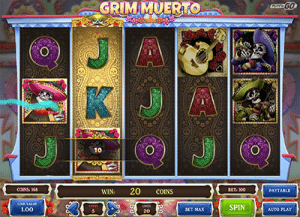 Grim Muerto comes with a jackpot of 250,000 coins which can be won during the free spins bonus. Grim Muerto is based around a fun storyline, following a deceased mariachi band whose members come back from the dead to join the Day of the Dead celebrations. Across the reels you’ll find Fernando the fiddler, Tauro the trumpeter, Amador the accordionist and Vincente on the vihuela (which is the Mexican guitar), all in perfect skeletal form adorning full mariachi attire. Mixed in with the skeletons are standard 10, J, Q, K, and A symbols, plus special symbols responsible for triggering the bonus features. Wild symbol – the games wild symbol is the Mexican guitar, which substitutes all other symbols to form a win except for the scatter. Scatter symbol – the scatter is the Book of the Dead (El Libro de los Muertos) and an appearance of three or more of these anywhere across the reels will trigger 10 free spins, with spins valued at the bet amount that started the bonus. Free spins bonus – within free spins there are multiple extra bonus features. Firstly, there’s the addition of the candle symbol, an appearance of which will re-trigger more free spins – one candle will award three free re-spins, while two candles will award six free re-spins. 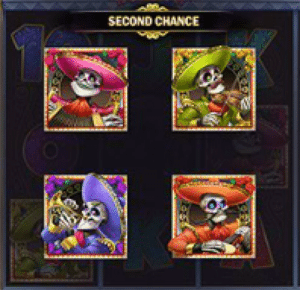 Secondly, during free spins, one of the mariachi skeleton symbols will also become wild and can substitute for any other symbol except the scatter to create additional wins. If the mariachi wild lands between the second and fifth reel, it will expand to replace all other symbols across that reel. Second chance bonus – if you only land two of the Book of the Dead scatter symbols, you’re still in the money, as this will trigger the Second Chance Bonus feature. Here you get to select one of the mariachi symbols to reveal a bonus reward, which also carries the possibility of unveiling the scatter symbol to trigger the free spins bonus. Marco Siniestro bonus – during the base game, one reel is randomly selected and highlighted during each spin. Any wilds that appear on the highlighted reel will turn into expanding wilds and replace all other symbols on that reel to form bigger wins. Play’n Go software is offered at several of the top rated multi-provider casinos, and you’ll find Grim Muerto and other Play’n Go titles for free play and real money bets at the leading pokies sites in our casino table above. Our readers get access to exclusive welcome bonuses, so sign up using our links to claim some sweet rewards like matched deposit bonuses, free spins and more. All of these sites are available for instant-play and accept deposits using a range of secure payment options like Visa, MasterCard, Neteller, Skrill, Paysafecard and direct bank deposit. Grim Muerto is a breath of fresh air amongst some particularly stale releases from Microgaming lately, and makes us incredibly excited about the potential creations to come from Play’n Go. This is everything an online pokies game should be – creative, unique, fun, and packed with bonus features that not only increase winning potential but also add a lot to the entertainment factor. We were already huge fans of Thunderkick’s Esqueleto Explosivo slot game which also uses the Day of the Dead theme, so Play’n Go had some pretty big shoes to fill to impress us, which they certainly managed to do with Grim Muerto.